Donovan Lyles Jr. lost an eye but not his spirit. Five-year-old Donovan Lyles Jr. was playing video games at his home on Detroit’s east side in January when he was struck by a stray bullet as a result of a random shooting. He went on to lose his eye, but not his spirit. “When I told him his eye was gone he said he would just have to become a pirate then,” his mother Emily Brazelton told ABC News, adding that the boy never panicked or cried, remaining calm throughout the entire ordeal. His words touched the hearts of a local theater troupe, Captain Fishbones and the Pirates of the Forgiven. After one of its members saw his story on the local news, they decided to throw him a pirate themed party. DJ, as he is known to friends and family was christened “DJ the Daring” at the party, Carole Cross, the troupe’s “purser” told ABC News. “That’s now his official pirate name,” she said. (Carole Cross/Captain Fishbones and the Pirates of the Forgiven) Donovan Lyle Jr. and the cast of Captain Fishbones and the Pirates of the Forgiven. 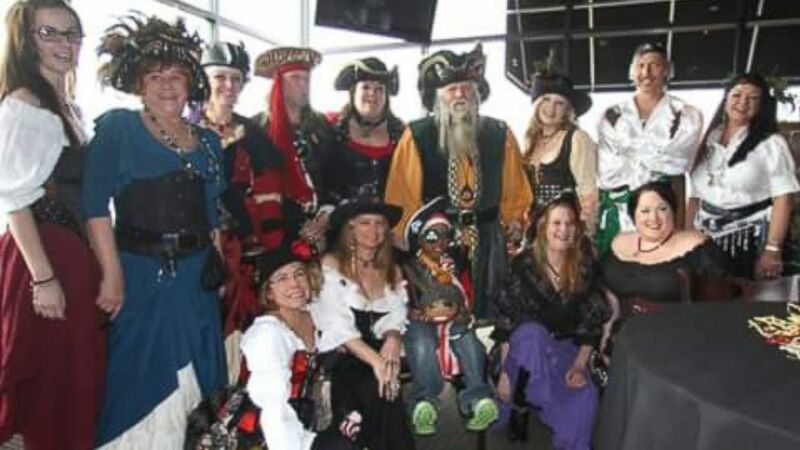 The party was held at a local pirate-themed restaurant in nearby St Clair Shores, Michigan. Guests came decked out in swashbuckling costumes complete with eye patches in honor of the boy, Cross said. Lyles was shy when he first entered the room, his mom said. But once he realized it was a party just for him he couldn’t stop sword fighting and hugging everyone he met. He and his two sisters, Emory and Eternity, were especially thrilled with the gift bags full of “treasures”, Brazelton added. Her son has always been an upbeat and resilient child, Brazelton said. He became interested in pirates after watching the movie “Pirates of the Caribbean”, she said. No one has been arrested for the shooting, Brazelton said, and the family moved to a safer neighborhood the day the boy was released from the hospital. She was fired from her job as a grocery cashier shortly after the incident because she was unable to work while caring for her son, she said. Despite everything, Brazelton said she is thankful for the wonderful party -- and thankful in general. “That same night a little girl was shot and she didn’t make it,” Brazelton said. “I feel ridiculously grateful that I didn’t lose my baby."